Japan has objected to the choice of dessert at Friday's summit between North and South Korea. 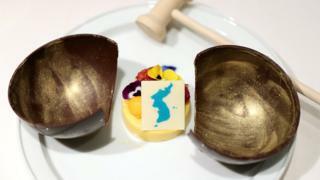 The country's foreign ministry issued a "strong protest" over plans to serve a mango mousse, featuring disputed islands on a map of the Korean peninsula, at the meeting. Walnut chairs to be used during the summit also show the controversial map. The islands are currently controlled by South Korea but also claimed by Tokyo. Japan occupied the Korean peninsula from 1910 to 1945, when it was defeated in World War Two. Tensions remain over the status of two main islands and around 30 smaller rocks, known as Dokdo in Korean and Takeshima in Japanese. North Korea's Kim Jong Un and South Korean President Moon Jae-in are due to arrive for talks at the border village of Panmunjom on 27 April. The menu for the summit has been carefully prepared to include dishes from both Koreas. A Swiss potato dish will also be served in a nod to the North Korean leader, who is believed to have attended school in the country. It will be the first inter-Korean Summit in over a decade and will be followed by a meeting between the North Korean leader and US President Donald Trump, next month or in June. The renewed diplomatic efforts come amid a thaw in relations between the North and South, with athletes from the North attending the 2018 Olympic Games in the South in February.